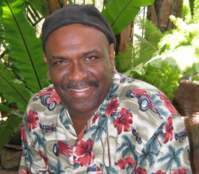 Originally from Belize, JR Crawford has a long history of arranging, producing, directing and performing with some of the biggest names in Caribbean music. Recently he was the musical director/arranger of a concert held at Royce Hall (UCLA) California which featured David Rudder, Calypso Rose, Robert Greenidge and The Mighty Sparrow sponsored by Mr. VanDyke Parks. He has also produced & arranged Trinidad hits "Sweet Ramona," (winning Panorama song) "Big Bottom Woman" and "The Bomb" He also arranged, produced and co-wrote "Fresh Air" by Boogsy Sharpe (Trinidad). Some of the other artists he has worked with are Robert Greenidge (Jimmy Buffett / Trinidad Desperadoes), Wailing Souls, Denise Plummer, Duke, Crazy, Baron, Rolling Stones, Vince Charles to name just a few. He has performed on MTV, Deal or No Deal (also Musical Director) and has played numerous set parties on some of today's leading film and television shows including: Hook, The Bold and the Beautiful, Roc, Evening Shade and Michael Jackson Video Party in Palm Springs.